Unlocking the Secrets of SAP Lumira Discovery 2.1 - EV Technologies, Inc. I recently needed to generate a product key for SAP Lumira Discovery 2.1. So I built a new system in the SAP License Manager and selected SAP Lumira 2.1 from the drop-down list. There wasn’t an option for a Lumira 2.1 key, so I chose to generate a Lumira 2.0 key. 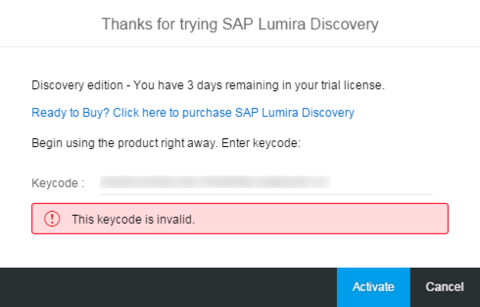 Sadly, Lumira Discovery 2.1 isn’t impressed with a Lumira Discovery 2.0 license key. After scratching my head, I remembered that choosing V2.0SP02 as a key version was an option. It was worth a shot. And sure enough, that key made SAP Lumira Discovery 2.1 happy. You can read more in SAP KB 2519499 – How to create license keys for SAP Lumira Discovery 2.0 and 2.1.